First thing’s first, it’s crucial to maintain a regular cleaning regimen. Brush at least twice per day, once in the morning and once before bed. You can increase that figure to three times, once after each meal, for even better results. Use a soft-bristled brush (since harder bristles can actually damage enamel), and a toothpaste that’s designed to fight cavities while whitening your teeth. Floss regularly to clear out plaque between your teeth, and use mouthwash if you have particular trouble with bacteria accumulation in your mouth — you can also find whitening mouthwashes on the market that are designed to do just that, whiten your teeth. Electric toothbrushes are even better than traditional toothbrushes. Since these toothbrushes feature a moving head, and most designs are built to reach those more difficult places (like the gaps where your wisdom teeth used to be, if you’ve had those teeth pulled), electric toothbrushes provide a more thorough cleaning. Plus, electric toothbrushes’ randomized head motion provides the kind of clean you can only achieve by moving a traditional toothbrush up, down, left, right, and in circles — which can be a difficult feat in those hard to reach places. You can visit a licensed dentist for a professional whitening. Visit us here at Love to Smile if you’re in the Overland Park area. We provide professional whitening services which surpass those whitening products that you’ll find in the supermarket. Professional whitening is fast, convenient, long-lasting, and effective. Plus, our treatments are safe, and they’re well suited for those of us who have sensitive teeth. You can learn more about our professional teeth whitening services. If you’re just brushing your teeth every day, you could be doing more for your teeth by scrubbing your tongue! It’s a fact that often goes overlooked, but brushing your tongue provides even better dental health, and it can mitigate the effects of those staining foods and drinks that we consume. Scrubbing your tongue reduces the amount of acid-producing bacteria in our mouths, and it helps to wash out leftover debris from food and drinks. Our tongues are highly textured surfaces, and they can harbor bacteria and particles, including stuff that can stain your teeth. So, for a truly thorough clean that can lead to a whiter smile, you should scrub your tongue whenever you brush. It’s all too easy to consume things that damage and discolor our teeth. We wake up to a cup of coffee. We chase lunch down with a soda. We indulge in a glass of wine with dinner. All of these items can harm your teeth, and they stain your otherwise white pearly whites. Fortunately, you can counteract those foods and drinks with favorable beverages and snacks. Here are a few to add to your diet — they’re especially beneficial if you finish a meal with a few sips or bites! Broccoli: Broccoli isn’t just good for your health, it can lead to a whiter smile. As InStyle points out, broccoli “can act as a natural toothbrush that can clean teeth as you chomp away. Plus, the high levels of iron can coat the enamel to help ward off stains, harmful bacteria, and acid erosion.” The same article notes that it’s best to consume broccoli raw to naturally scrub teeth as you chew. Apples: Similarly, apples scrub away debris from your teeth, so they’re a good option at the end of your meal. Eat a few wedges to clear away particles that could stain your teeth and cause plaque buildup. Plus, apples contain malic acid, a chemical which triggers our salivary glands. Our saliva naturally cleans teeth, and healthy saliva production can reduce staining. Be sure to brush your teeth still, since apples do contain sugar which can eventually aid in bacteria production. Strawberries: Strawberries also contain that helpful chemical, malic acid. Take a few strawberries at the end of your meal to cleanse your teeth and naturally whiten them. Again, be wary that these fruits aren’t a substitute for brushing, so keep with your daily regimen! Carrots: Carrots are nutritious and they naturally scrub your teeth the same way as the aforementioned foods. Polish off a meal with a couple of carrots to reduce the impact of harmful foods and drinks. Cheese: A hard cheese can be beneficial for your teeth. Add gouda to your meal to cleanse your teeth and to give them a boost of calcium and vitamin D, which help to strengthen your teeth and bones. Other Dairy Products: Most dairy products are beneficial for our teeth, so long as you aren’t mixing dairy with sugar, acidic ingredients, or alcohol. Feel free to follow a meal with a glass of milk. Or opt for sugar-free yogurt to improve your oral health. Water: Water is truly a cure-all. Finish a meal with a few swishes of water to clear away harmful, leftover material. And drink water throughout the day to give your teeth the stuff they need to thrive from the inside out. Plus, when you aren’t dehydrated, you produce more saliva, which further improves the health and look of your teeth. If you don’t have a carrot or some strawberries on hand, a stick of gum can work wonders to keep your mouth free from stain-causing debris. Stick to gum that is sugar-free, with xylitol. Xylitol triggers saliva production, which can, once again, aid in washing away acids and staining materials. Have a pack of gum handy throughout the day to clean your teeth after lunch or a snack — but refrain from using gum in lieu of brushing regularly. If you love sweet drinks, well, we have some bad news. Sugary drinks are the bane of stains (that rhymed!). Sugars are easy for bacteria to digest, and bacteria thrive, reproduce, and pour out acid, which can stain your teeth. 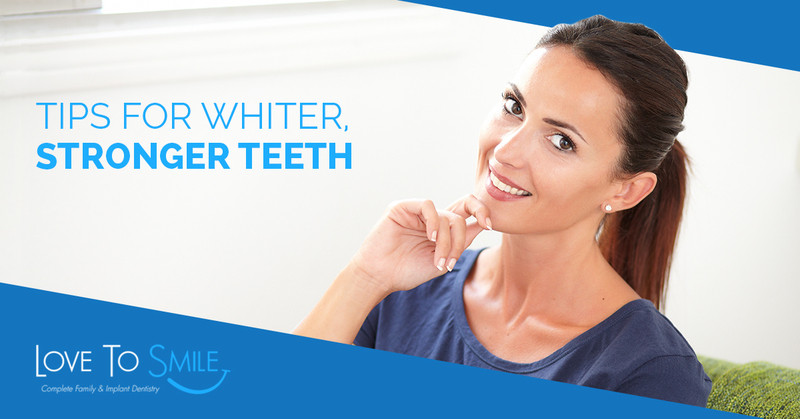 Pair that with food coloring that’s present in colas, sports drinks, and juices, and you have a recipe for off-white teeth. If you choose to indulge in sugary drinks, it’s best to drink through a straw. Using a straw will bypass your teeth (although some of the fluid will remain in your mouth, even with this precaution), which means that these drinks have less of an impact on the coloring of your teeth. And if you’re drinking sugary drinks, it’s a good idea to follow up with a glass of water, swish a gulp between your teeth to further reduce that sugary film that can build up in your mouth. Here at Love to Smile, we love it when our guests proudly display their pearly white teeth. That’s why we encourage our patients to take care of their smiles with regular checkups, and our cosmetic dentistry solutions. If you’re curious about our teeth whitening services, or any of our dental practices, feel free to reach out to us — you can also schedule an appointment!